“This book is about the impossibility of saying in one sentence what a situation is about.” So says Joris Luyendijk, author of Fit To Print. Awinner of the prestigious 2007 NS Publieksprijs, this reveals how a Dutch-born fluent Arabic-speaking Middle East war correspondent spent five years in military battle hotspots such as Lebanon, Iraq and the Israel/Palestine border, and concluded that the more he discovered about working in the region, the less he really knew. Amidst reporting from ruins where dwellings once stood, dodging sniper bullets and dealing with endless border patrols and incompetent officials, Luyendijk is candid about his encounters with academics, military officials, human rights activists, students, residents in hot spots and anyone else willing to be heard, or speak out. He is honest enough to realise his own faults gathering stories as a reporter and the associated dilemmas in extracting details from individuals who have a potential story. Luyendijk is firmly focussed on delivering the stories that rarely get coverage, and searches high and low to break the elusive headline that does not look at the peace process, suicide bombings, and anti-Western/anti-Islam rhetoric. We get to see just how diverse the Middle East really based on regional subtleties in language, etiquette and tastes. Who would have thought that businessmen in Damascus openly wish to know why a country such as the Netherlands, with so many talented footballers, has not won the soccer World Cup, or the number of jokes that Jews and Arabs make about themselves rather than against one another? How much of a difference would this make in altering our perceptions of the Middle East and its people? There are some great moments in this book that show why the media industry is such a cut-throat business, and this makes a welcome change from hearing about the typical accounts of corruption or encounters with fanatical citizens, monuments, and shows of propaganda through various nations in the Middle East. Accounts of journalists being reduced to tears after waiting long periods of time to be issued Iraqi entry visas from the Jordanian border in 2002 are among the many priceless anecdotes wittingly recorded. It’s like visualising a crying child being told they cannot enter a toy store during the Christmas rush. “Mobile telephones off, cameras, action! And she began to cry. She told the story through her tears. “Shall I act out how I hid from the militia?” She pushed a childish face and mimed peering out from behind an imaginary wall. ‘That’s what I did for French television.’ The cameraman had known her from previous recordings. Gathering from Luyendijk’s experiences, is it time the media re-invents itself to ensure that the viewing public are getting all the facts rather than a simplified universal view imposed on them? Are journalists pawns in this industry? He uses the metaphor that the news is a conveyer belt in a bread factory and that correspondents stand at the end pretending to have baked a loaf, “when all they have done is provided the wrapping.” It’s a perspective that continues to divide opinion, and is as polarising as the Israel/Palestine conflict itself. 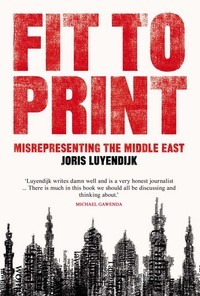 Fit To Print should be on the reading list of anybody who wants to understand why news is filtered and cares for the direction that international news reporting is heading towards, especially in the Middle East. The experiences that Joris Luyendijk shares with us are presented in a heartfelt manner that correspondents from major networks will do well to learn from. Who knows, networks may one day even remove the bias they tend to possess and air a real, rather than pre-conceived insight into the Middle East. His language, a mixture of criticism, lament and helplessness, should prompt us to re-think not only what makes the news, but why the headlines are reported in such a manner. Should readers adopt a more sceptical approach towards consuming the international news reporting process, then Luyendijk’s contribution is that journalism can rightfully be regarded as a craft.